Each year we strive to make lasting legislation that will protect our land for years to come. 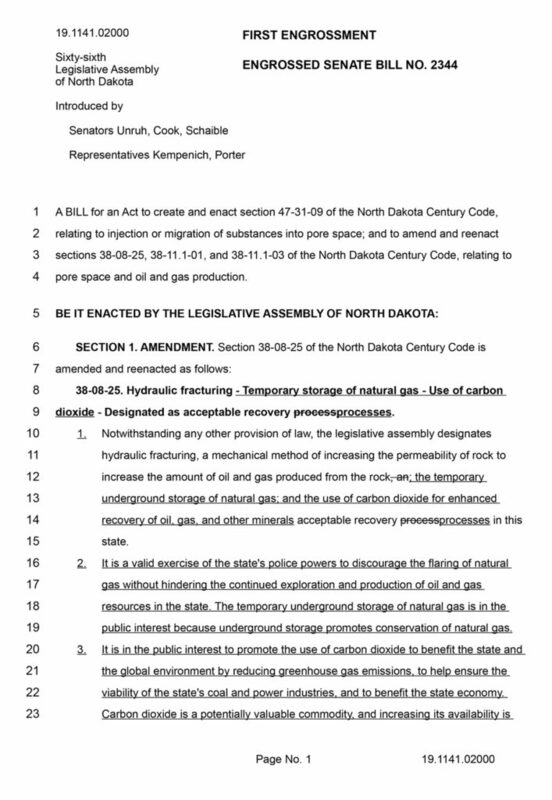 A BILL for an Act to create and enact a new section to chapter 17‑04 of the North Dakota Century Code, relating to liens and wind energy property rights. Passed Senate. Introduced in the House. House Energy and Natural Resource Committee hearing is scheduled for Friday, March 15, at 9:00AM. Please contact your legislators and urge a DO NOT PASS! Bills on Wind Liens, Eminent Domain, Reclamation Bonds, Landlord / Tenant, Market Value Cap, and Baseline Testing are the main topics NWLA is lobbying for in the 2019 Session. In the 66th Legislative Assembly, there are 79 republicans and 15 Democrats in the House of Representatives and 37 Republicans and 10 Democrats in the Senate. Republican and Democratic House and Senate members have selected the following leaders for the 2019 Legislative Session: House and Senate. During a legislative session, a legislator can be reached at the State Capitol by leaving a message with the legislative telephone message center at (888) NDLEGIS (635-3447) or (701) 328-3373 (local). That number can also be used to obtain information on bills under consideration. A legislator can also be reached by mail or email and address rosters are posted at http://www.legis.nd.gov/contact-my-legislators. Detailed information on legislative activities is available on the Legislative Assembly website. HB 1151:The “Spill Bill” would no longer require companies to report spills of crude oil, produced water, or natural gas that are contained to a well site or production location and are less than 10 barrels (420 gallons). The current rule is to report spills of 1 barrel or more. This bill has been signed by Gov. 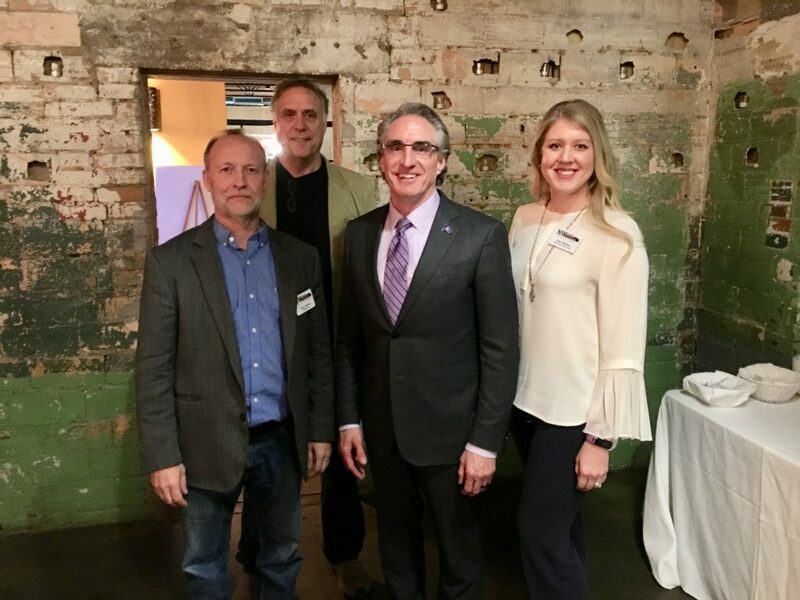 Burgum NWLA is NOT in support of this legislation. SB 2236: This legislation would make permanent the Ombudsman Program, which was established in the 2015 Legislative Session through a bill that NWLA championed. NWLA is in support of this legislation. This bill was passed. SB 2327:This bill would create the Division of Environmental Quality. NWLA recommended consideration of an amendment to allow for ⅓ representation on the board by agricultural representatives. 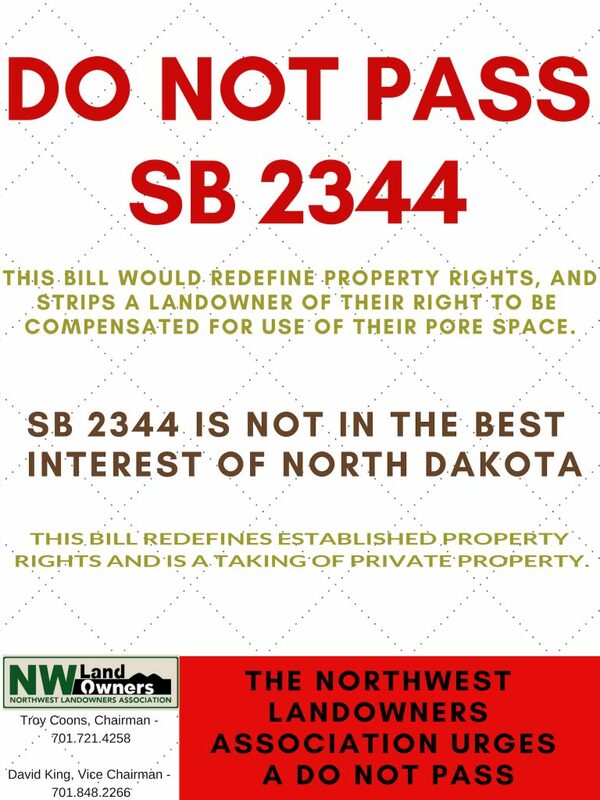 NWLA feels this ratio is justified by the estimation that 90% of North Dakota’s land is utilized for agricultural purposes and ¼ of our economy is agriculturally based. This bill has been approved at ⅓ representation agricultural representatives on the Division of Environmental Quality board. This legislation has been passed. NWLA is in support of this legislation. SB 2333:This legislation was introduced by NWLA and moved rule for DMR guidance into law 38-08. This legislation handles reclamation of all land, on and off site of oil well pads; and provides soil protection. This legislation passed and was championed by NWLA. HB 1244: This bill is a quick take by the water boards and will most likely be killed. This legislation did not pass. NWLA is in support of this legislation. HB 1020: This bill would implement taxation of fresh water sold by landowners, with funds going towards WAWS. This segment of legislation did not pass. NWLA is NOT in support of this portion of this legislation. SB 2313: Wind oversight and Reclamation legislation. NWLA recommendation is to have the PSC in charge. The Ombudsman program that was created in 2015 has been expanded with a memorandum of understanding for the Agricultural Department to work with PCS pipeline and wind farm development. SB 2331: The “Sampling Bill” relates to the protection of groundwater and other responsibilities of a mineral developer. It would require that soils and groundwater be sampled on oil and gas sites to provide a background record for spill cleanup. NWLA introduced and is in support of this legislation. This legislation did not pass. 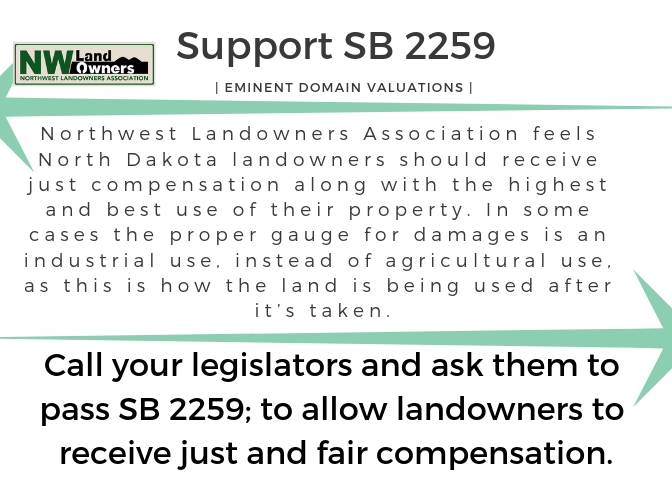 SB 2047:Same as HB 1244, looking to add provisions of SB 2332 (Eminent Domain compensation) to it. 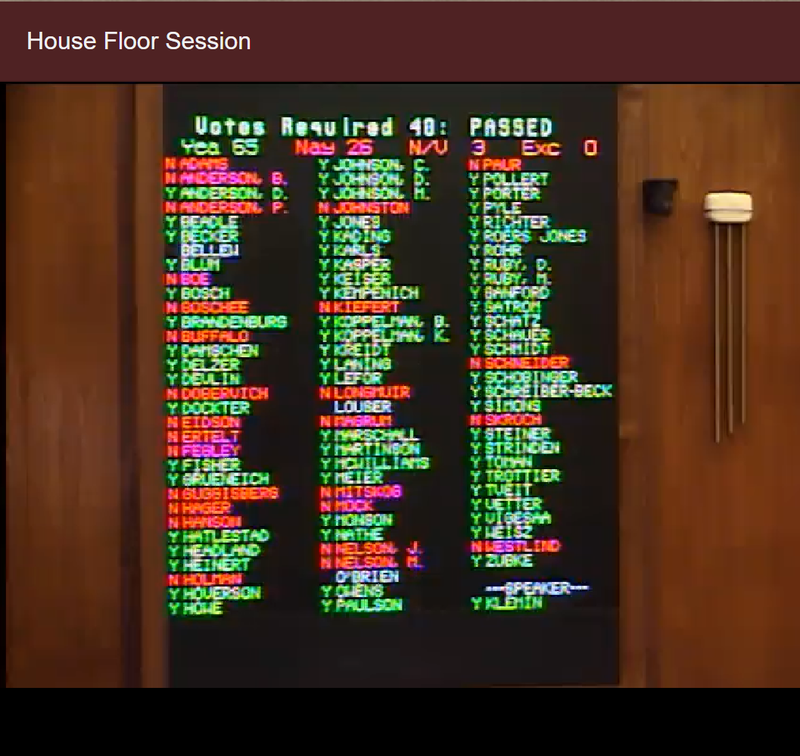 The amendments from SB 2332 did not pass. NWLA is in support of this legislation. 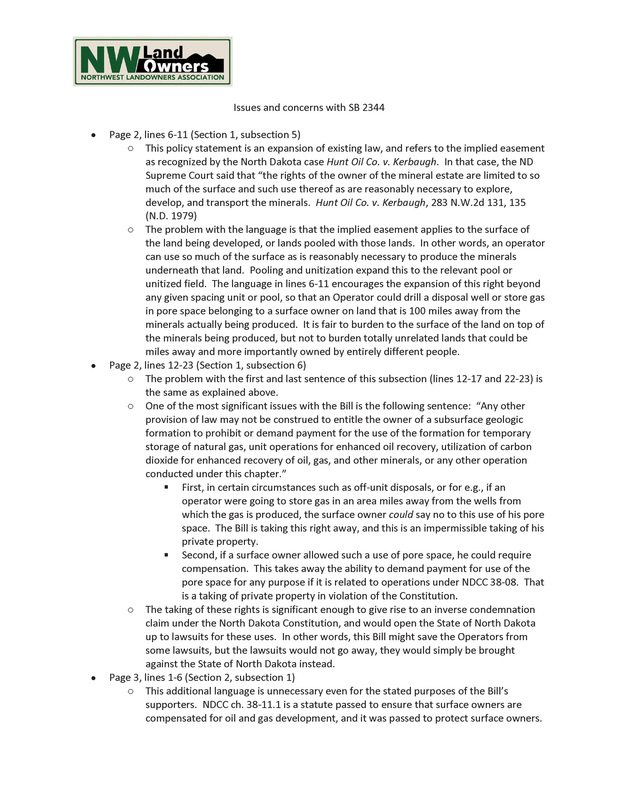 SB 2156: The “Radioactive Waste” bill. This legislation was passed without the amendments. NWLA was in support of the bill and amendments. Amendments to this bill were added to address concerns of local elected officials representing the residents. 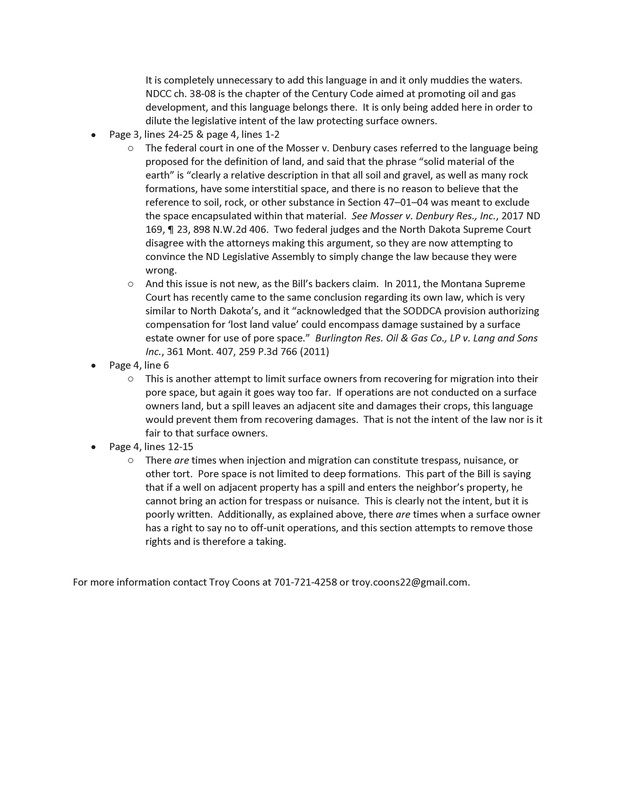 The amendments would have made the local elected officials to the first to be notified. 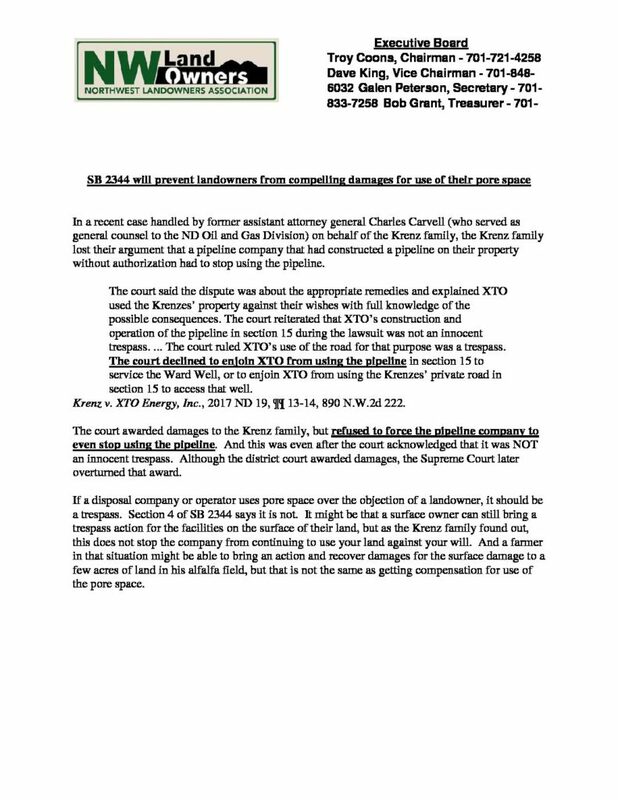 SB 2332:The “Eminent Domain Bill”. This legislation failed to pass. NWLA introduced and is in support of this legislation. Additional bill monitored by NWLA were, HB 1336, HB 1187, HB 1282, HB 1293, SB 2313, SB 2263, SB 2286, SB 2036, SB 2225, SB 2314, SB 2134, SB 2027. NWLA was able to get an amendment into the PCS budget for a wind farm study. This study will help guide the agency and aid the property owners with the effects of a wind farm. NWLA sponsored three cafe style talks to educate landowners. 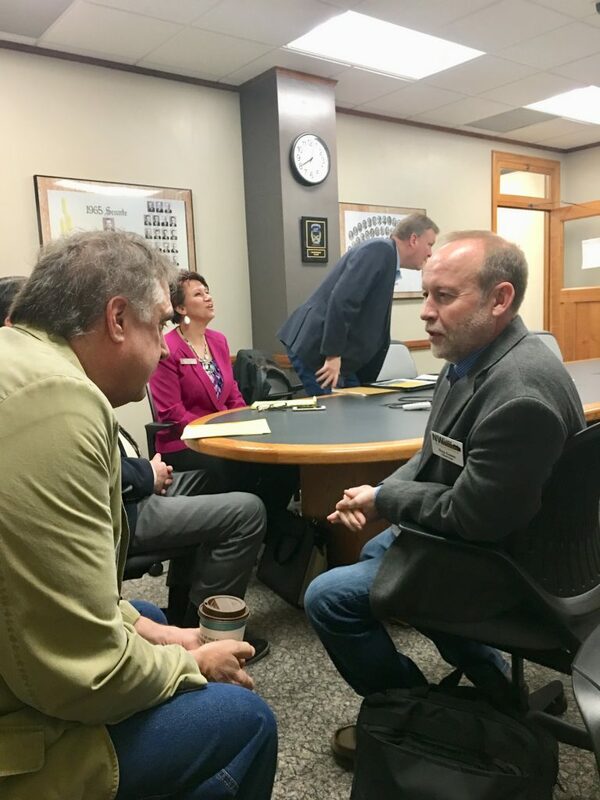 During this open conversation between landowners and soil specialist; we discussed the severity of brine spills, what a landowner can do if they see a brine spill on their property, and the different means of reclamation used after a spill. NDSU Extension Services and the NWLA urges all landowners to report spills of any size immediately and to take pictures of the spill site. Several NWLA board members are currently in negotiations for setting new guidelines for remediation and reclamation protocols; along with new standards. who do you contact for an oil spill? If there is any question as to the proper response, call one of the listed agencies and provide all relevant information about the incident. 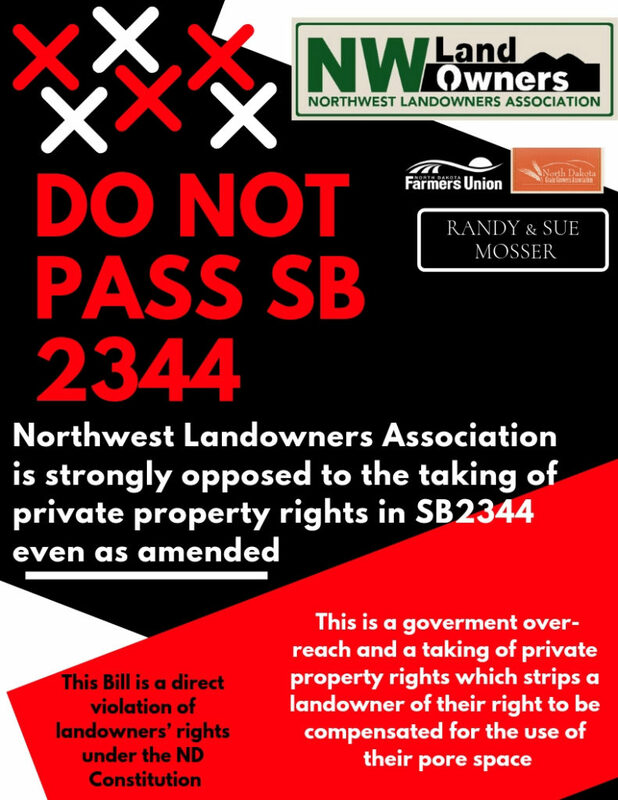 Donate to the NW Landowners Association to help continue work to pass important legislation!